Activities in your home should take place where they will be in harmony with the five elements. Therefore, room placement is very important. Correct placement of the kitchen, bedrooms and bathrooms is crucial. It is easy to determine where the activities in the house should take place. Just keep in mind the placement of the five elements: water in the northeast, fire in the southeast, earth in the southwest and air in the northwest. The natural placement for the kitchen, therefore, is in the southeast – the home of the fire element. This placement brings physical health and harmony in the family’s relationships. By coordinating your actions with the elements your activities will go smoothly. 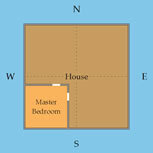 Bedrooms can be placed anywhere except the northeast quadrant, as this brings chronic health problems. Whenever possible, the master bedroom should always be in the southwest—the place of ‘commanding’. Heads of the household should sleep in the southwest so that the household runs smoothly. If children are in the southwest, they will dominate the family and be overburdened with responsibilities inappropriate to their age. The master bedroom may also be placed in the southeast if the southwest is used as an office.